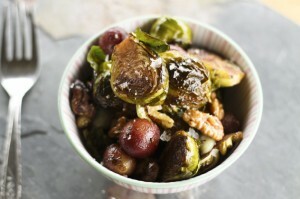 For a heartier dish, add 1/2 cup of toasted and roughly chopped walnuts after roasting. For a more complex, earthy flavor, add 1 tablespoon fresh or 1 teaspoon dried thyme when you mix the brussels sprouts and olive oil. Trim the Brussels sprouts and cut in half. Toss with olive oil and place Brussels sprouts, flat side down, in a large skillet over medium heat. Sprinkle with a pinch of salt, cover and cook until tender, about 5 minutes. Increase the heat to brown. Add grapes to pan to lightly roast. Turn with spatula to brown all sides. Season to taste with a pinch of salt and pepper and serve.